Sovereign Gold Bonds Scheme is an indirect way of investing in Gold. Instead of buying physical gold, investors can buy gold in paper form through Sovereign Gold Bonds. The under-lying asset for these bonds is Gold. These bonds track the price of gold, plus an extra interest amount is paid on the investment. The Reserve Bank of India, in consultation with the Government of India, has decided to launch Sovereign Gold Bonds Scheme July 2016 public issue. Applications for the bond will be accepted from 18th July, 2016 to 22nd July, 2016. This is the first tranche of the Financial Year 2016 – 2017 and fourth tranche overall. The first tranche (FY 2015-16) of the Gold Bonds scheme was launched in November 2015. The issue had got a subscription for 915.95 kg gold amounting to Rs 246 crore. The second tranche (issue) was launched in Jan, 2016. The issue had got a subscription for around 2,800 kg gold amounting to roughly Rs 750 crore. The third tranche was launched in March, 2016. In the first three tranches of gold bonds issued during the financial year 2015-16, about 4.50 lakh investors purchased total bonds equivalent to 4,908 kg, amounting to about Rs. 1,320 crore. Applications for the fourth tranche of ‘Sovereign Gold Bonds Scheme’ will be accepted from 18th July, 2016 to 22nd July, 2016. 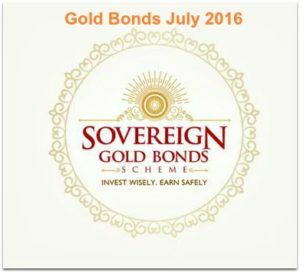 The Gold bonds will be issued on 5th August, 2016. 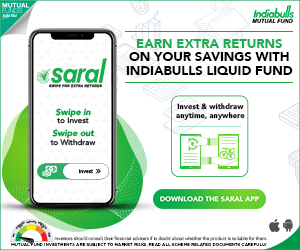 The Bonds will be sold through banks, Stock Holding Corporation of India Limited (SHCIL) and designated post offices. Fourth Issue Subscription dates : 18th July to 22nd July, 2016. Public Issue Price : The government has fixed Rs 3,119 per gram as the issue price for the fourth tranche of Sovereign Gold Bonds (SGB) scheme. The Reserve Bank had earlier fixed the public issue prices at Rs 2,916 per gram, Rs 2,600 per gram & Rs 2,684 per gram for the third, second and first sovereign gold bonds Issues respectively. Duration of Bonds : The tenor (tenure) of the Bond will be for a period of 8 years with exit option from 5th year onwards. Gold bonds shall be repayable on the expiration of eight years from the date of the issue and premature redemption is permitted after 5th, 6th and 7th years from the date of issue of SGB. Minimum investment Size : Minimum permissible investment will be 1 unit (i.e. 1 gram of gold. To attract small investors, the minimum subscription has been reduced to 1 gm from 2 grams). Maximum allowed investment : The maximum amount subscribed by an entity or an individual investor will not be more than 500 grams per fiscal year (April-March). A self-declaration to this effect will be obtained. Since this is the first tranche of the FY 2017 fiscal, a new maximum annual limit of 500 gm applies to investors. In case of joint holding, the investment limit of 500 grams will be applied to the first applicant only. Interest rate on Gold Bonds : The investors will be compensated at a fixed rate of 2.75 per cent per annum payable semi-annually on the initial value of investment. 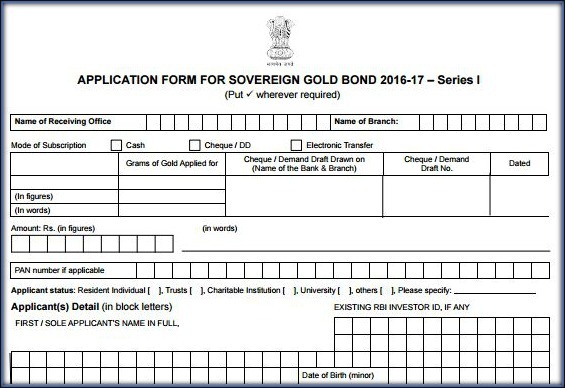 Click on the below image to download Gold Bonds Application form 2016-17 Series -1. The biggest disadvantage of Gold bonds is lack of liquidity. The lock-in period is 5 years. But you can sell the bonds on stock exchanges. Earlier this week, stock exchanges BSE and NSE had launched online bidding platforms for SGBs. The exchanges will act as receiving offices for this tranche. The online platforms are expected to raise demand for SGBs in the demat form. RBI has already made the first tranche of SGB tradeable and the other tranches, including the present one, are expected to become tradeable in 3 months’ time. If you HAVE to invest a portion of your savings in Gold for long-term, Gold bonds outscore the Gold funds / physical gold and can be a preferred mode of investing in Gold. But this fourth tranche comes at a time when the gold prices have already touched a near three-year high following the Brexit vote and world-wide growth concerns. The issue price for this tranche will be higher than the previous issue prices. Gold Bonds FY 2016-17 – Latest Public Issue : Applications for the proposed Fifth tranche of ‘Sovereign Gold Bonds Scheme’ will be accepted from 1st September, 2016 to 9th Sep, 2016. The Gold bonds will be issued on 23rd Sep, 2016. After 5 years, investors can approach the concerned bank/Post Office/agent thirty days before the coupon payment date. Request for premature redemption can only be entertained if the investor approaches the concerned bank/post office at least one day before the coupon payment date. I dont think any penalty is levied on the redemption amount. The price which is prevailing at that point of time will be considered for repayment. First of all, thank you for your efforts in putting the article in a very simple way. A very informative article. 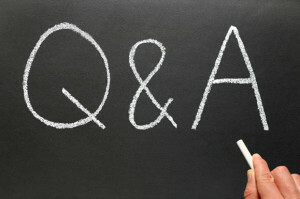 I have a question on the extension of the gold bonds after its maturity. As mentioned by you, bonds get matured after 8 years & the bond holder will be given option to extend it by 3 or more years. When the option will be given for extension ? What is the process for extension ? How many times can bond holder extend it ? For e.g. Say the maturity is in 2023, can then this be extended any number of time ? Even I heard that there is an option to extend the holding period beyond 8 years for up to maximum 3 more years, but could not find any official source confirming this (in case if you have any govt notification, plz do share it here). It is an optional feature, a gold bond investor can decide to extend the period if he/she believes that gold prices have fallen drastically in 8th year.. I believe only for one time it is allowed for up to 3 years. Thank you Sreekanth for your reply. No buddy, I am sorry, I dont have any govt notification also unable to find any official source on the same. I have read it in your article & in other article on another blog, but nothing is mentioned on SGB official website on the extension part after maturity. I had applied for SGB (July 2016 Issue) via ICICI Direct.Com. Was of impression that allotment will be completed by 5th August 2016. However till date I have not received any e-mail confirmation for allotment or any DMAT credit for the units purchased. Can you please suggest how I can check its allotment status? Where can I lodge a complaint if its taking a long time than usual? Is it RBI? I have an application reference as is visible from my DMAT account (Order details). Dear Debashish ..Kindly check with your demat service provider. Partially agree with you..the bonds do track the price of underlying asset – gold. Ponzi Scheme ? May not be, as these are backed by the Govt of India. Hi Shreekant…This is Kunal.I am preparing for the Bank exams and I found your posts really helpful in garnishing my preparation.They are informative and interesting. Thank you dear Kunal. All the best for your exams! For Gold sovereign Bond contact Pawan 9462659179 SHCIL Stock holding approved by Rbi . 0.50 paisa commission will be given.